It’s beginning to look a lot like Christmas at the Ball household. A University of Florida Christmas wreath is hanging on the front door (love the Gators! ), the tree is decorated, and the stockings are hanging on the mantle. I knitted stockings for Steve and me on our first Christmas after we were married–way back in 1981. The next one was made when Chris was born in 1985, and the twins’ stockings were added in 1987. 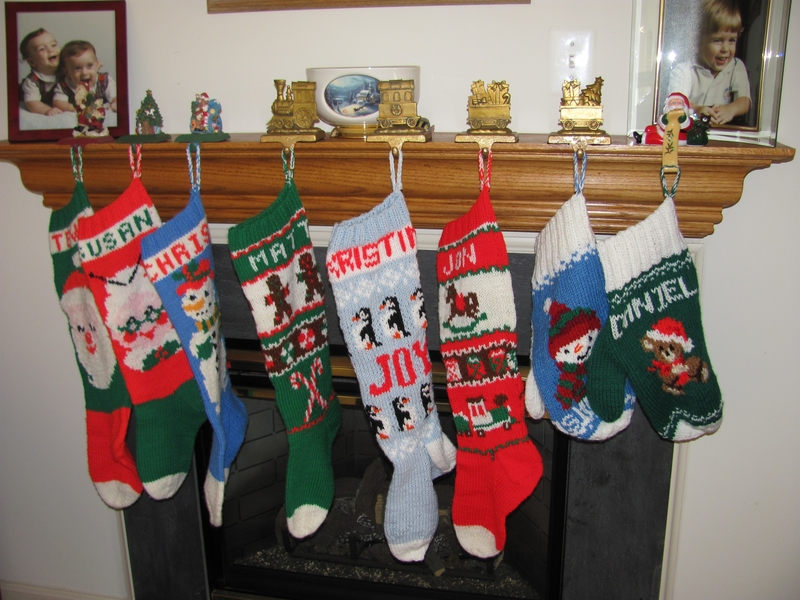 For more than 20 years, there were five stockings on our mantle. In the past few years, our mantle has become more crowded. The boys are grown and starting families of their own. We’ve added two daughters-in-law the past two years, and this year brought the joy of our first grandchild. What a pleasure it has been for me to celebrate these precious new members of our family by knitting stockings for them. I am looking forward to knitting more stockings to hang on the mantle in the coming years as our family continues to grow. On the first Sunday of December each year, we take the children from our church’s boys and girls ministries Christmas caroling at a senior independent living community. After the morning service, the children and the chaperones meet in the fellowship hall. Fruit baskets are assembled for the nursing staff while the children practice the songs. We always serve pizza for lunch. Some children only agree to go caroling because they want pizza. We know that. While we would prefer they come for more charitable reasons, we know something they don’t. Even the reluctant children will touch the hearts of those who hear them sing, and they will be touched in return. The singing starts in the activity room for those who have gathered. After the carols are concluded, the children hand out gifts to the residents. It is an easy way to get shy children to mingle and interact with the seniors. This year the children handed out stockings they had decorated, cards they made, and bags of home-baked cookies. The children eagerly present their gifts to the residents and make sure that everyone is included. The residents reciprocate with smiles and hugs. When the program is done, we walk through the halls singing and handing out the rest of the gifts. The children are excited every time a resident opens his or her door and joins in the singing. The resident is serenaded for a few minutes and receives many hugs before the group moves on. Some of the residents are unable to walk to the doorway so relatives or staff members open their doors to let them see and hear the children. Often the children will march right into the apartment to hug the resident. It’s very moving, and those are my favorite memories of caroling. There’s a lot of truth in the carols they sing. The children may not fully appreciate the meanings of the songs, but the residents who have sung these songs for decades certainly do. I’m sure the words become more precious as they realize their time on Earth is nearing an end, and they will soon meet the baby born on Christmas day. Taking forty children Christmas caroling requires a lot of planning and coordination. The date has to be scheduled. Chaperones have to be secured and transportation arranged. Permission slips have to be signed. Gifts and cards have to be purchased. Pizza has to be ordered and cookies baked. We have moments when we wonder if it worth the effort, but those moments are fleeting. We only have to recall the experiences of previous years to realize that we will bless and be blessed by our afternoon spent Christmas caroling. There’s really no better way to get into the Christmas spirit! According to legend, the tradition of hanging Christmas stockings was started in the days of St. Nicholas. The good bishop, wishing to help a poor father by providing a dowry for his three daughters, tossed three bags of gold coins down the family’s chimney. The bags landed in the stockings the girls had hung by the fireplace to dry. The next morning, the girls found the gold and, thus, were able to marry. The tradition continues nearly 1667 years after the death of St. Nicholas. When my older sister, Sharon, was born, my mother’s mother started a family tradition of hand knitting Christmas stockings for each of her grandchildren. My grandmother loved to knit, and I loved to watch her hands fly as she knit booties, blankets, scarves, hats, and, of course, Christmas stockings. She helped me to knit a pair of booties when I was seven. I was very proud of those pink booties made with variegated wool yarn. I wore them until my feet outgrew them. I didn’t knit anything else until I was about eleven. That summer my grandmother re-taught me to knit and I made a scarf. I soon learned to knit by the feel of the yarn and sometimes continued to knit in the dark after my parents had made me turn out the light. By the time the eighth grandchild was born, I was a proficient knitter. My grandmother decided it was time to pass the family tradition down to me. She gave me her patterns and taught me how to change colors without leaving holes in the stocking. She helped me to stitch Jimmy’s name across the top. Two years later, I made my second stocking for my youngest sibling. When I got married, I left my stocking at my parents to be hung each year on their mantle. Thirty years later, their mantle is crowded with the stockings of their nine children and many of their grandchildren. I knit a pair of stockings for my husband and me for our first Christmas. Later, we added stockings for our three sons. Over the years, I have hand knit dozens more stockings for siblings and their spouses, nieces and nephews, cousins, and assorted other relatives and friends. A few years ago, one of my sisters commented that our mother was the only family member who did not have a knitted stocking. Mom had a felt stocking she had been hanging up since she married. Dad had started out with a matching felt stocking also. However, my grandmother knit him one and sent it to him in 1968—the year he was stationed in Viet Nam and could not be home for Christmas. I don’t know why she never made one for her daughter, and I don’t know why it took so many years for me to realize that I should make one for her. I rectified that immediately and made one for my mother-in-law the same year. As our sons have married, we have added stockings for their wives to our mantle, and I have made a pair for each new couple for their own homes. This year, the tradition continues onto a new generation. I will knit a stocking for my first grandchild and proudly hang it from our mantle. What a delight it has been for me to knit stockings for four generations of our family over the past 36 years. It is a tradition I hope will continue for many generations through my nieces and, perhaps, one day through a granddaughter, if God so blessses. God used another baby boy to draw my family into a relationship with Him. My brother John was born when I was 5 years old. Although our mother had contracted rubella early in the pregnancy, John was declared healthy and sent home. However, we soon learned that John had serious heart defects and the he could neither see nor hear. John underwent open-heart surgery when he was three months and endured several more surgeries in his first few years of life. My mother began praying, asking God to heal John. One day she asked an acquaintance to remember John in her prayers. The woman proceeded to share the gospel with my mother. Although my parents had attended church all their lives, until that day neither of them had a personal relationship with Jesus Christ. My brother died from heart complications before his eighth birthday. During his short life, both of my parents and many other family members came to a saving knowledge of Jesus Christ. Although we miss John and think of him every day, we know that one day we will be reunited with him in Heaven. This Christmas, and every Christmas, I am thankful that the Son of God humbled Himself and became human on our behalf and that God used a blind and deaf child with a bad heart to show my family our need for a personal relationship with God.